The torrential rains came after weeks of bushfires and searing heat across the country, the New York Times reports. Both the Brisbane and New York Times said the floods exceeded the “night of Noah”, an event in January 1998 that dropped 54.88 centimetres of rain on the area. “Residents have been spotted kayaking down veritable rivers where pavement used to be,” the Washington Post reports. “Others caught off guard by the incessant downpour had to flee to their rooftops for immediate safety. Throughout the region, whole blocks of houses are half-submerged in murky water,” and residents are also being warned to watch out for crocodiles and snakes in “unexpected places”. Enoch also reminded residents that snakes are “very good swimmers”, and Queensland police urged people to stay out of the water. The rains forced officials to open the floodgates at the nearby Ross River Dam, which had hit nearly 250% of its capacity, and instruct residents to move to higher ground and save water. “This continued heavy rain and flooding has damaged homes, isolated communities, and displaced people from their homes,” said Queensland’s acting communities minister, Shannon Fentiman. 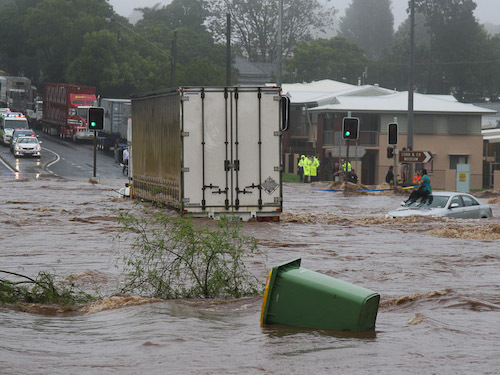 The Insurance Council of Australia declared the floods a “catastrophe”, with thousands of properties at risk, and General Manager Karl Sullivan noted that high housing density in “hazard areas” was boosting the risk and cost of flooding. “We’re building more things that are more expensive” in “risky places,” he said. While one region of the Australian continent dealt with excess water, another area was suffering from its absence. With national elections coming up next month and climate change expected to be a top-line issue, “Prime Minister Scott Morrison and Opposition Leader Bill Shorten both visited Tasmania on Monday, where catastrophic bushfires had reportedly destroyed eight homes and burnt 190,000 hectares of land as of Monday afternoon,” the Sydney Morning Herald reports. “Fires are a natural phenomenon in the Australian bush, but experts say climate change effects such as heatwaves and changed rainfall patterns mean bushfires are becoming more frequent and extreme,” the Herald notes. Earlier this week, decorated Australian firefighter Greg Mullins drew new attention to that risk, stating that “climate change is contributing to bushfires so horrendous that homes and lives cannot be protected, and the federal government will not acknowledge the link because it has failed on emissions reduction policy,” the paper adds. This terrifying spectre of what is happening in Australia has only one upside in my opinion. In the best case scenario, it will get all sides of the political spectrum talking on the same page and making some progress in how to lower global carbon emissions. This may finally set us on a course that is moving towards a low carbon future. All governments around the world need to take heed.